only form the available vacancies in Women and Child Development Department ICDS Anganwadi Supervisor Jobs on Contractual basis in various field offices of WCD Department of Odisha State. These posts are come under Group B cadre. 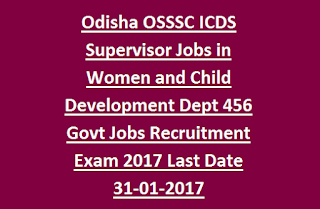 Only women/female candidates are eligible to apply for these Supervisor posts in Odisha ICDS Department. Eligible candidates can submit their application form through Odisha SSSC official website @osssc.gov.in. Online applications starts from 00-00-2018 and last date for registration online is 00-00-2018. 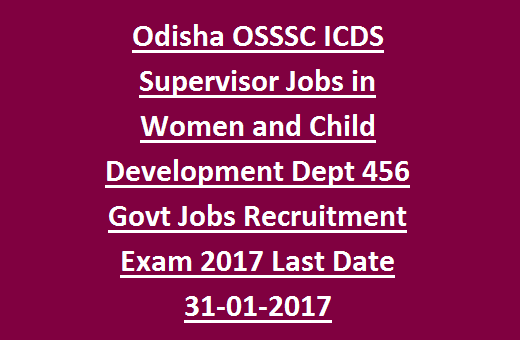 There are total 456 ICDS Anganwadi Supervisor Jobs available in this OSSSC Women and Child Development Dept Recruitment 2018. For details category wise vacancies, exam procedure, syllabus, application fee, how to apply online and more information is given below. There are total 456 vacancies available in this Supervisor posts of Women and Child Development Department. As on 01-01-2018 candidates minimum age limit is 21 years and maximum age limit is 32 years. Upper age relaxation of 5 years is given for SC/ST/SEBC candidates. Candidate must have completed Bachelors degree in Arts or Science or Commerce from a recognized university. General/SEBC Candidates can pay the fee online through osssc.gov.in website payment gateway using debit or credit cards on online banking on or before 31-12-2016. Selection for Supervisor Jobs will be held based on initial screening and written test. Initial screening will be held based on candidates educational marks of 10th, 12th and Degree. A short list will be prepared through screening test. Those who are short listed those candidates only called for the Written Examination. Written examination consists of two papers each paper having 120 marks. 10. Office & Personnel Management. (ii) Basic Knowledge in Computer & IT:- Knowledge in operations of Computer, MS Windows, MS Word & MS Excel. 9. Reasoning and Aptitude Test. (v) Odia: - Grammar, Composition. Translation, Re-Translation. Eligible candidate can submit application form through the official website of Odisha SSSC @osssc.gov.in online or before 00-00-2018. For more details regarding payment options refer the official notification. Download official notification here for Anganwadi Supervisor Jobs in Odisha.